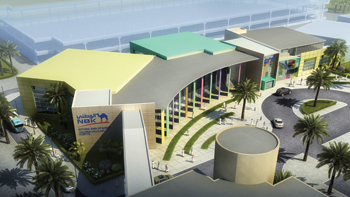 The new unit at NBK Children’s Hospital ... an artist’s impression. SSH took extra care of details when it designed the new oncology unit at NBK’s Children Hospital in Kuwait, considering the nature of the project and its future occupants. Design consultancy SSH’s site supervision team has recently taken over from its design delivery team working on a specialised children’s oncology unit at the NBK (National Bank of Kuwait) Children’s Hospital, signalling that work is due to commence shortly on site for the medical facility in Kuwait City. When designing the bone marrow transplant (BMT) unit extension at the hospital, SSH needed to take a number of factors into consideration, given the nature of the facility which treats cancer patients among children and the fact that would be built close to a multi-storey car-park and needed to be linked to the existing hospital. And although linked to the NBK Children’s Hospital, the unit is required to function as an independent entity. SSH’s scope of works is to ensure that the project as a whole, including the massing and landscaping, is efficiently integrated and provides a suitable environment for the intended users, namely children. Nasa Contractors has been appointed the main contractor on the project under a KD4.2-million ($14.2 million) construction contract which excludes FFE (furniture, fittings and equipment), and ICT systems. Currently, site clearance and excavation works are in progress at the 10,974-sq-m site of the BMT located south of the NBK Children’s Hospital within the Al Sabha Medical Campus, according to SSH. Bright colours, warm timber finishes and playful images were preferred. Work on the 5,946-sq-m facility is expected to be completed by the end of 2017. Commenting on the design work on the project, SSH technical director (partner) Adriaan Vorster says: “Planning and design were tailored around the users of the facility namely, children. 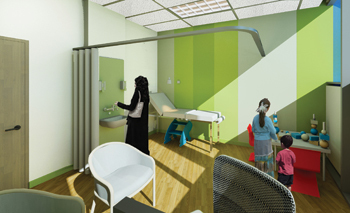 The design aimed to maintain a child-friendly environment throughout the project, even in the bone marrow transplant rooms where the extremely hygienic conditions dictated and reduced the spectrum of finishes that could be used. “The white ‘clinical’ appearance associated with medical facilities was avoided in favour of bright colours, warm timber finishes and playful images. This is most apparent at the main and outpatient entrances. The new NBK Children’s Oncology Hospital building consists of an outpatient department (clinics), day-care facilities (infusion and treatment areas), a bone marrow transplant unit (specialist inpatient unit), specialist laboratories (haematology/oncology testing), pharmacy, administration and educational areas, case conference and lobby services. The mechanical and electrical services were designed to support Phase One and potential further phases, if required. The design of the unit was influenced by the fact that to the rear of the site lies an existing multi-storey car-park, which blocks potential views from the new building. Also, the unit shares an open surface car-park with the existing children’s hospital. A further driver was to optimise the utilisation of an elongated site. “This was achieved by dividing the massing into three distinct blocks, connected via a glazed atrium spanning the length of the building, which ‘breaks’ the long elevation and creates a more human scale,” he explains. Among other aspects, Vorster points out that with the new NBK Children’s Oncology Hospital being an extension to the existing hospital, a link between the two facilities was required. However, the existing road eliminated the possibility of pedestrian movement at ground level. The solution was to introduce a link at both the first and second floor levels, he says. 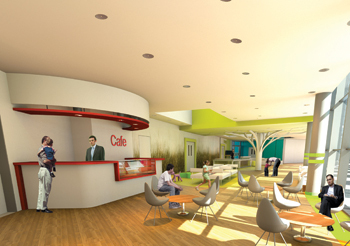 SSH maintained a child-friendly environment throughout its design. The design and construction of the new facility will also follow sustainability guidelines. Citing particular aspects of the project, Vorster says the design utilises sustainable features such as correct building orientation, view considerations and technologies, such as envelope insulation to reduce energy consumption. The use of locally sourced materials was also encouraged to reduce the carbon footprint of the building. Vorster points out that a prominent feature of the project is the large vertical louvres in front of the long glazed atrium to the northwest. Another important aspect is the mechanical and electrical systems that will be in place at the new facility. “Due to safety and security considerations associated with a children’s oncology hospital, the building management system (BMS) had to achieve over and above average industry standards. Circulation of children under a predetermined age is tracked throughout the hospital using a wireless patient tagging system. Sensitive clinical spaces and MEP (mechanical, electrical and plumbing) rooms received card and/or biometric access control points,” he comments. SSH is a leading masterplanning, infrastructure, building design, construction supervision and project management firm in the Middle East, with a reputation for design integrity and a portfolio that includes landmark projects throughout the region. The firm maintains offices in Kuwait, Oman, Qatar, the UAE, Iraq, Bahrain, Algeria, South Africa and London. Founded in 1961, it has completed more than 1,000 projects, and is ranked the third best architecture company in the Middle East and amongst the top 100 architects in the world by World Architecture magazine. SSH’s multifaceted practices include architecture, urban design and planning, structural and civil engineering, MEP/building services, interior design, highway and bridge engineering, stormwater drainage, utility design, sanitary engineering, marine engineering and district cooling, in addition to high-profile project management and construction supervision services. It also has vast experience in a wide range of building types, from residential and commercial, retail and leisure, healthcare, education, high-rise, convention and cultural centres, to theatres and opera houses.